Pretty Purplexing: Tag - your it! 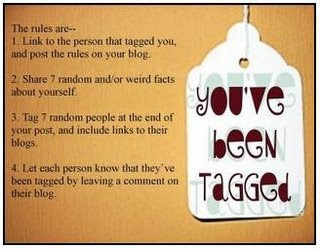 I was "tagged" by another blogger friend. In response, I have to list eight random facts about myself. 1. I am the oldest of three girls. 2. I met my husband while working at KFC. I taught him how to be a cashier. 3. I have worked for my parents business since 1995. 4. I appear confident on the outside, but very insecure on the inside. 5. I have been researching my family tree for many years. 6. I am extremely proud of my grandfather and miss him very much (he passed away in April this year). 7. I love the smell of a hockey rink. I am tagging: Ann R. & Heather F.! It's your turn! #7 why did I not think of that one! I am so new to computer stuff I think I pushed the wrong button yesterday and took all the blogs off my list that I follow. You should be back on now, I too enjoy following your blog. A slide board helps with leg strength and skating speed.